More companies are committing to gender equality. That’s the good news, according to McKinsey’s Women in the Workplace 2017. The study was conducted in partnership LeanIn.Org and examines data from 222 companies with more than 12 million employees, from a survey of more than 70,000 workers, and a series of qualitative interviews. However, the good news comes with a caveat. If I scroll back to basic concepts I learned in psych courses, people generally are comfortable with the status quo, even when it works against their best interest. A classic case-in-point: Silicon Valley 150 companies. (See SV 150 Gender Diversity.) You can check theIf that status quo is discriminatory, that may not register. Moreover, change is scary. The study did uncover areas that men can address. For gender diversity to happen, men need to become allies. To date, they don’t quite understand all that keeps women from advancing. The study found that inequality stars with the first promotion with women of color experiencing the most bias. From the outset, fewer women than men are hired at the entry level, even though women now comprise 57 percent of recent college graduates. At every subsequent step, the representation of women further declines, and women of color face an even steeper drop-off at senior levels. 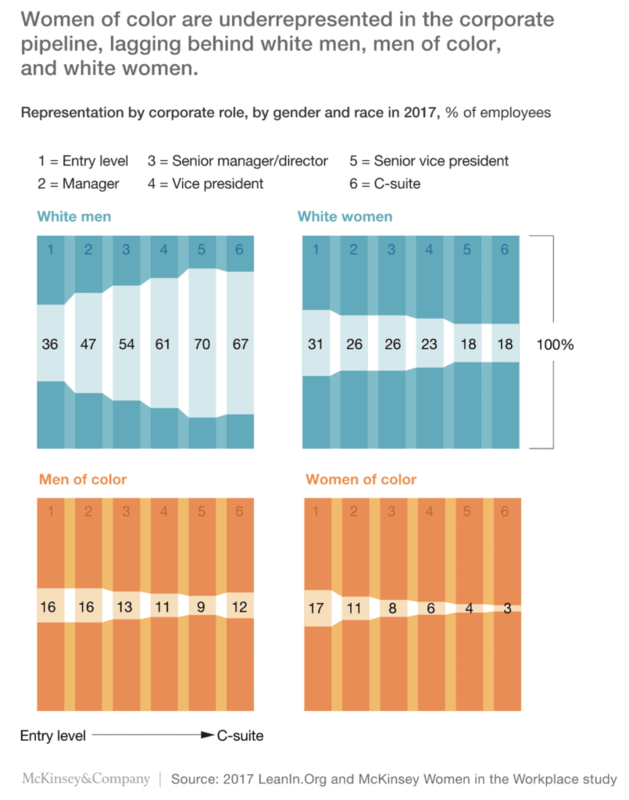 As a result, one in five C-suite leaders is a woman, and fewer than one in 30 is a woman of color. Moreover, compared with the modest gains women made in prior years, there are signs this year that women’s progress may be stalling. Women, on average, are not leaving these companies at higher rates than men. Rather, they face more barriers to advancement and are less likely to reach senior leadership positions . . . Women see an uneven playing field—a workplace tilted against them. Women are twice as likely to believe their gender will make it harder to advance, and senior-level women view gender as a bigger obstacle than entry-level women do. I happen to head a retained executive search firm (The Good Search) and recruiting research practice (Intellerati). We help corporations become more diverse where it counts the most: at the board and senior executive levels. 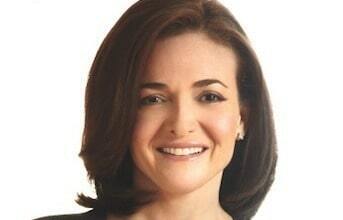 Interestingly, from a global perspective, there is but one group that is under-represented in the C-suite: women. Yet when qualified women executives are included in slates of finalist candidates for senior leadership openings, all too frequently men get the offers. I’ve seen it happen time and again at the very corporations that say they want to be more diverse and that invest in programs promoting diversity. I think I know one of the reasons why. Women continue to hit the glass ceiling — despite the best intentions of concerned corporations — due to employee referrals. Employee referrals — often a favorite source of hires for corporations — have a way of undermining diversity efforts. They perpetuate the status quo. Birds of a feather not only flock together: they want to work together. Consequently, members of homogeneous executive teams tend to refer in more of the same. White male executives frequently recommend other white male executives through employee referral, not because they’re overtly or consciously prejudiced. They do it because these are the guys they know. Once they do, those recommended candidates have the wind at their backs. Employee referrals typically bypass the screening and recruiting process that was put in place to ensure consistent quality and diversity. Candidates who are referred in by a team member are often introduced immediately to the hiring executive. So by the time the referred candidate is introduced to HR to fill out the necessary applicant paperwork, the white male candidate referral has become a runaway train. In that scenario, rock-star executive women and diverse men are snubbed for lesser executives because the white guy has become unstoppable as a candidate. Referrals offer a rich source of pre-referenced, often plug-and-play talent. For companies scaling quickly, referrals can make all the difference between filling the role in a timely fashion or having it languish unfilled as the rest of the team gets stressed out from over-work, missed deadlines, overdue product launches, and lost revenue. The opportunity cost for failing to fill senior executive openings is massive. There’s a legal cost as well. If you don’t put a stop to shortcuts for the white guy with connections in your employee referral program, you are putting yourself and your company at risk of being slapped with a discrimination suit due to disparate impact. You can get nailed even if you believe in diversity and actively promote advancing women and other diverse candidates into senior executive ranks. If you fast track your majority class through employee referral while giving unrepresented classes the third degree, that fact alone could very well come back to haunt you in court. So what’s a hiring executive to do? Do a quick check to determine whether your employee referral program is torpedoing your diversity efforts. Educate those who refer prospective candidates to eliminate their inherent bias by advancing diverse candidates. Do not allow referred candidates to bypass phone screens and other processes required of other candidates. For an opportunity to be truly equal, the playing field must be leveled. Identify, profile, qualify, and cultivate relationships with diverse candidates in advance of job openings. Make sure they are as well-networked into your company as the majority. Conduct competitive mapping to identify all viable candidates for a role to ensure inclusion of diverse candidates — prospects that all too often are overlooked. Naturally, I “googled” it to see if I could find such a diversity unicorn. The National Association for Female Executives (NAFE) listed 2 companies in its 2015 Top 50 Companies for Executive Women with 50% women in roles reporting directly to the CEO: DigitasLBi and State Farm. However, that was as of February/March 2015. When I double-checked the About page for DigitasLBi, only 25% (10 out of 40) of the listed leaders are women. So, DigitasLBi is not at 50% as far as I can tell. State Farm lists just the CEO on its Leadership Team page. Without transparency, it difficult to verify that half of State Farm senior executives are, indeed, women. However, whatever the percentage, one thing is clear: with few exceptions, there is a case to be made for more women at the senior leadership level. 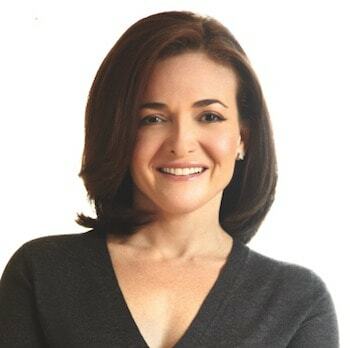 There are steps one can take to boost the diversity of women at the senior executive level. For example, our research division Intellerati conducts research to create diversity talent pools. We identify, profile, and qualify diverse executives to ensure inclusion in advance of openings. We help clients benchmark diversity best practices by conducting investigative research to determine the diversity of client competitors at the senior executive level. We then analyze that information to glean insights about what strategies and tactics actually move the needle. I’ve always found it strange that the federal government requires reporting of diversity statistics to the EEOC, but does not make that information public. But companies can report their own diversity statistics, inviting in the sunshine and diversity consciousness. Case in point: Microsoft. In December, CEO Satya Nadella released Microsoft’s federally-mandated diversity numbers in its EEO-1 form. He promised to do so after Rev. Jesse Jackson called on the tech industry to improve its diversity. In fact, a host of other tech companies, including Intel, have revealed their diversity numbers in the last year. Ms. Sanberg recommends increasing transparency to help employees see that there is, indeed, a problem. For other ideas, check out LeanIn.org and join a few of their circles. Check out Catalyst.org. Check out Women in the Workplace 2015, read the full report, and review their list of Things You Can Do. In other words, do something. Whatever step you choose, let’s take that journey together.